portraittheater follows Bertha von Suttner’s footsteps (1843 – 1914) from her early life as an Austrian countess to her self-determined engagement as an author and peace activist. She was a woman of passionate political interest, versatile abilities and persistent energy. In 2014 will be the 100th anniversary of her death. The drama „PEACE PLEASE! A Bertha von Suttner Show“ makes the connection between her engagement for peace more than one hundred years ago and today’s challenges for peace works. 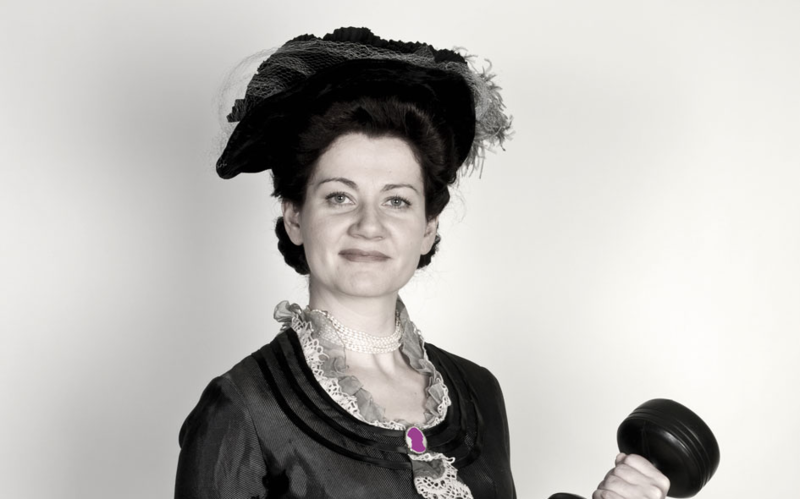 In the performance, directed by Brigitte Pointner, actress Anita Zieher embodies the life and work of the only Austrian Nobel Peace Prize winner in history. Embedded in a virtual radio interview during a broadcast show with the radio-journalist Udo Bachmair she talks about her choice of a rather unconventional way of life, about her work for peace, against anti-semitism and racism, and for the equality of women in society. Excerpts from her original writings form the basis of the drama. Video clips as well as current texts create a link to the present. Finally, scenes from the Danish silent film version of Suttner’s book „Lay Down Your Arms“ (1914) are added to the fabric of the play. The performance is both funny and serious, entertaining and informative, historical and contemporary. Critics and audiences alike have embraced the play with enthusiasm. portraittheater focuses on extraordinary persons, especially women, and brings their life and work to the stage. Programmes: Hannah. Understanding. A dialogue with Hannah Arendt, 2006. Designing Yourself – A Simone de Beauvoir Update, 2008. PEACE PLEASE! A Bertha von Suttner Show, 2009. Being a guest of Bertha von Suttner, 2010. George Sand meets Frédéric Chopin, 2011. How should I hold my soul: Hommage to Oskar Werner, 2012. Director: Brigitte Pointner works as a director in Lower Austria and Vienna. She graduated from directors schools LAUT and worked with several theatre ensembles in Austria. Since 2006 she has been directing the plays of portraittheater. At the beginning of the play Bertha von Suttner describes as a guest in a radio show the superficial life of the high aristocracy, her aim to become a famous opera singer, her distress with several fiancés and the financial ruin of her family due to her mother’s compulsive gambling. These circumstances led to her decision to work as a governess in the house of Baron Suttner. When the Suttner family realized she had fallen in love with Arthur, the youngest son, she was forced to leave the house. She proceeded to move to Paris, where she worked with Alfred Nobel, the inventor of dynamite. After only a few weeks in Paris she left Nobel and fled with Arthur von Suttner, whom she had secretly married, to the Caucasus, where the couple lived for nine years. In this time she builds up a career as a writer. She expresses her opinions about equal rights for women and men, and her engagement against anti-semitism and racism. She illustrates her involvement in the peace movement after writing her successful book „Lay Down Your Arms“. In a speech that echoes her appearance in the Capitol in Rome she emphasizes the most important views of the peace movement. Suttner also explains the daily obstacles she faces in her work, her international reputation and circumstances for receiving the Nobel Peace Prize. The interviewer also asks her about her failures and her resilience and what can be done for peace nowadays.